PraguePremierAccommodation, a 3-star Prague apartment hotel in the center of the city offers a home away from home with self-catering apartments and amenities to help you enjoy your stay. Guests can work off the previous night's indulgences in the hotel's fitness and aerobics classes, relax in the aqua center or the solarium, or maintain their beauty regimen with a visit to the beauty salon. Club Oasis City is the onsite restaurant and bar, and 24-hour reception and security service is on hand. 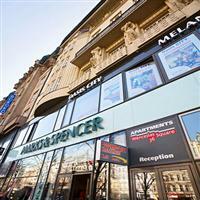 PraguePremierAccommodation's location on Wenceslas Square puts guests at the heart of this beautiful city, providing easy walking access to shopping, restaurants, bars, nightclubs, coffee houses, and historic landmarks.